This page is about the worldwide services John Biggar, the proprietor of ANDES, can offer as a personal mountaineering instructor and expedition leader. I can guide and instruct winter climbing, rock climbing and ski-mountaineering in Scotland and many places abroad. In the past I have run winter skills weekends, week long instructional courses and guided ascents of rock climbs and winter routes. I have worked with individuals and couples, Mountain Rescue Teams and mountaineering clubs, schools, the UK Navy and Royal Marines in both the UK and the Andes. My wife Linda Biggar is also a mountaineering instructor. 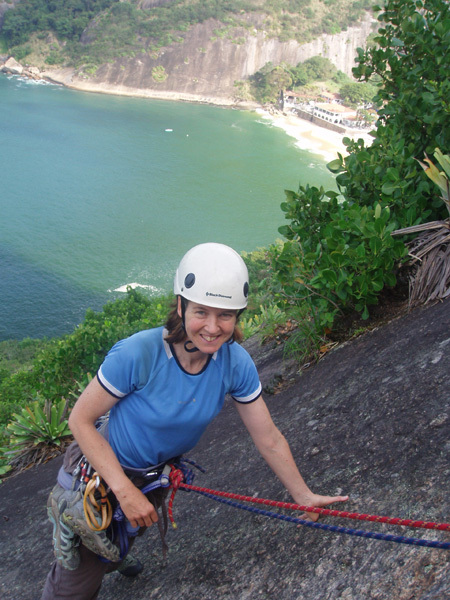 She's pictured here climbing in Rio de Janeiro, Brazil. For examples of the sort of courses and expeditions I can lead and guide please have a look at the Scheduled Expeditions Calendar page. Also take a look at the Expeditions & Explorations page, which lists and links to a large number of itineraries in the Andes that I have successfully guided previously. For more details of the sort of guiding and instruction I can do privately in Scotland have a look at the Go Climbing page on my personal website, www.johnbiggar.com . I can also arrange Expedition Logistics in many parts of the Andes, if you don't want a guide or leader but do want some sort of organisation in terms of hotels, transport, horses & mules, permits or other mountain services. Please call or email me to discuss your plans and for details and a quote. As a guideline my normal rates as an instructor are between £180 and £240 per day, depending on venue, season and numbers. For full Contact details click the link. Advice and information are usually free! I am a professional Mountaineering Instructor and member of the AMI. I hold the highest level of mountaineering qualification for the UK, the Mountaineering Instructor Certificate, (MIC) and have also done BASI level 1 as a ski instructor. I have been climbing in Scotland, both winter and summer, for over twenty-five years and know the best venues and the best routes. I have been involved in over 100 first ascents of routes and first ascents of many peaks, from finding new rock and ice climbs in my local Galloway hills to leading first ascents of seven 6000m+ peaks and numerous 5000m+ peaks in the Andes.